Every place in the world has its own tricks and traps that work to scam unsuspecting people out of their money. Some of these schemes are more menacing in nature, while others are simply a nuisance. As you travel, it’s important to be wary of some of the typical scams that frequent the place you are visiting to prevent unnecessary frustration and keep your money in your pocket. 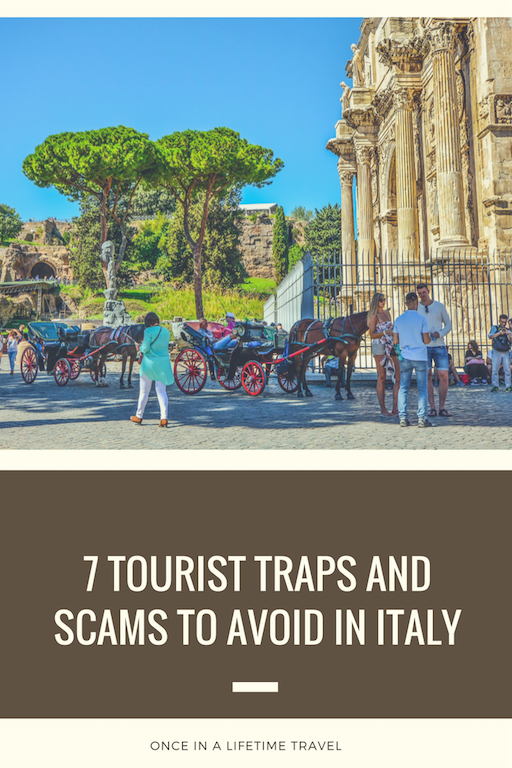 For travel, here is a list of 7 tourist traps and scams to avoid in Italy. These “live” statues are generally harmless and actually are an entertaining part of major cities. People will paint themselves and dress up to look like statues and will pose frozen for hours in city squares, hoping for visitors to appreciate their impressive work and provide a small tip. 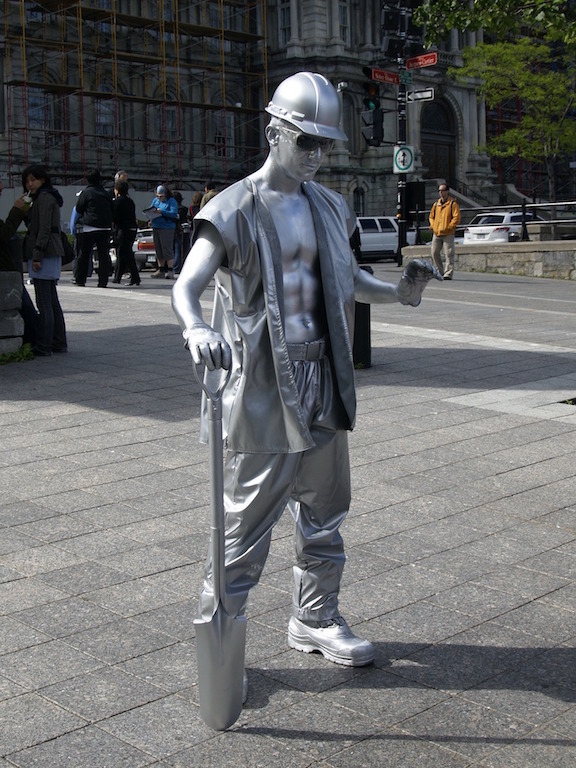 The problem comes when a tourist tries to take a picture of one of these living statues without paying up. In many instances, the living statue will approach the tourist and harass him until he provides some small compensation for the picture taken. I can speak from personal experience on this one. Although this is not technically a scam, it’s something to be aware of. 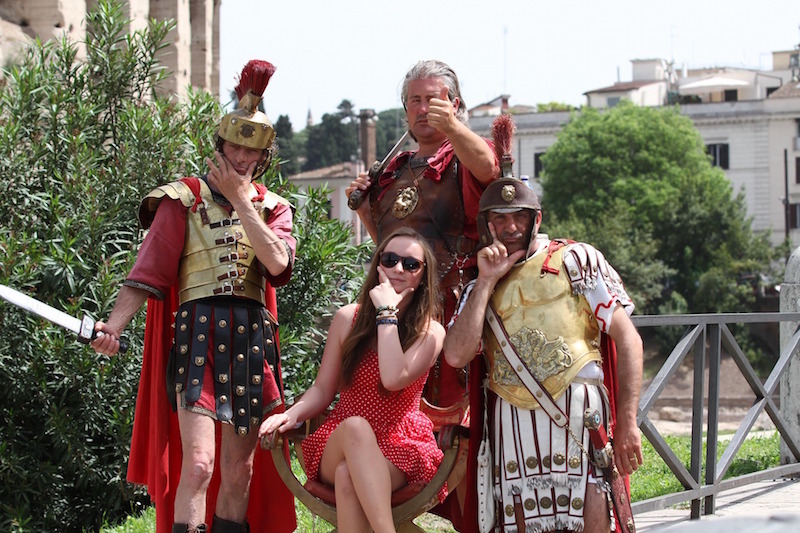 These costumed men often found in Rome’s city center, especially near the Colosseum, will turn on the charm and ask tourists if they want to take a picture with them, mentioning nothing about money. After the picture is taken, they will badger tourists for a small payment until the frustrated tourists give in. If you encounter one of these Roman gladiators, do yourself a favor, and keep walking. This trick is geared especially towards women. 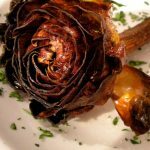 Men with bouquets of roses will saunter around, approaching women tourists and offering them a rose with much charm and charisma. When the woman accepts the rose, the man will ask her for some money as a payment, and if she is with a man, he will pressure him to pay up. When the woman tries to return the rose, he will try to refuse and keep pressuring her for payment. In this case, it’s important to be adamant in refusing a rose or giving it back if you have already accepted it. 4 Parakeets and Other Unexpected Tricks. When I was in Rome, I once encountered a man with a parakeet who offered to let me hold it. I agreed, and my friends took a picture of me with the small bird. When I returned the parakeet to the man, he held out his hand and asked for some money. I could not believe that he expected me to pay for something so silly, but he pestered me until I was frustrated enough to give him some change. This scam along with similar interactive tricks is prevalent in the city center of Rome, and if you come across anyone offering you to hold a bird or something else, don’t give him a second glance. At major transportation stations, there are many people who keep an eye out for stressed out and vulnerable travelers. Once they find a victim, they will approach the travelers and offer to help them purchase their transportation tickets. After assisting them, these people will expect some payment for their services and will not leave until they are paid. If you need help purchasing tickets or figuring out other transportation details, look for an official employee or approach another traveler for guidance. In this scheme, men will approach tourists and offer them a friendship bracelet, often tying it on their wrists before they have time to object. They will then request a payment for the bracelet. Many times, the victim will be forced to pay up because the bracelet will be tied on too tightly to take off and return to the troublemaker. If you see these men offering bracelets, keep your distance and keep your wrists out of reach. This is another scam geared towards mostly female travelers. 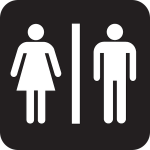 In this trap, men will typically approach women, asking for directions and claiming to be a fashion expert or designer, and they may even have convincing designs to persuade their victims. They will then offer the women a designer product such as a coat or bag as thanks for helping with directions. At this point, the “fashion expert” will mention that he is out of gas and ask if the women have some money to help him out. When the women comply, the man takes off and leaves the women to find out soon after that the designer item is a fake.